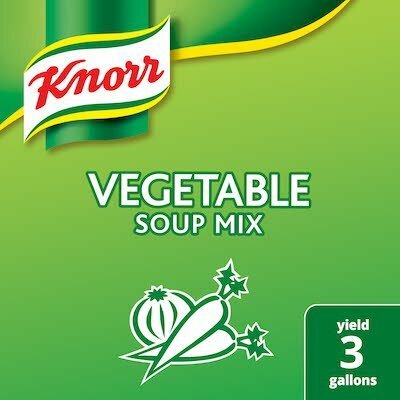 Vegetable Soup Mix a delicious addition to any of your savory dishes. Balanced bold flavors delivering a boost of culinary excitement. 1. Stir contents of package into 3 gallons of boiling water. 2. Bring soup to boil again. 3. Reduce heat and partially cover. Simmer gently for 20 minutes, stirring occasionally. Classic varieties and proven flavor profiles are equally delicious and convenient as soups or as flavor-boosting ingredients. Resealable package for added convenience and a long shelf life for easy inventory management and maximum economy.